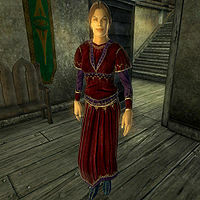 Aryarie, an Altmer nightblade, is an Evoker of the Mages Guild found in the Bravil Guild Hall. Her current line of magical research means she requires Imp Gall and she has hired the Fighters Guild to procure some. She lives a pretty uneventful life, spending most of her time wandering around the guild hall aimlessly. After waking up at 8am she strolls around downstairs for three hours and will then head upstairs. For the next four hours she will be found in the northeastern room on the second floor. At 8pm, after another 5 hours spent pacing the lower floor, she will dine for two hours with her fellow guild mates. Once finished, she will immediately head off to bed. The only change to this schedule is during the related quest, when she will wander around the ground floor for most of the day, taking a two-hour break at 1pm to eat lunch. She wears upper-class attire consisting of a red velvet blouse and garment with a pair of blue suede shoes. She carries around a sizable amount of gold and a shield ring, which is your reward for completing her quest. She doesn't carry any weapons, relying instead on a leveled set of spells from all of the magic schools but Mysticism. When you meet her for the first time, she will give you a brief introduction: "Aryarie. Your friendly Guild Alchemist. Satisfaction guaranteed. No free samples." She also has a few controversial opinions to share about Bravil: "Bravil? Good points? Cheap to live. Unpretentious. Free-wheeling. Bad points? Culturally, a hole. Count's a clown and his son's a skooma-sucker." On the Mages Guild topic, she will quickly guide you on to somebody else: "I'm just here doing research. If you need spells, talk to Ita or Delphine. They'll be happy to help." During the quest Unfinished Business, Aryarie chose to hire the Fighters Guild to fetch her some Imp Gall for her studies. Modryn Oreyn sent the always unreliable Maglir to do the task, but he defaulted yet again. When you take over the contract, an impatient Aryarie will greet you in the Guild Hall: "It's about time someone from the Fighters Guild showed up. I've got work for you to do. I need imp gall for my research." When asked about the Imp Gall, she will elaborate and point you towards Robber's Glen Cave: "I need imp gall for my studies. Ten portions of it, in fact. Since I hired the Fighters Guild, I expect you to get it done. And carefully, please. You might check Robbers [sic] Glen Cave for the imp gall. That place has been known to contain the imps." When asked about the Blackwood Company she will explain why she hired the Fighters Guild: "I just don't trust them. I know they're efficient -- a bit too efficient for my liking. Some endeavors demand time and care." She will send you to the cave with the words: "I'll be waiting right here." When you return, the busy mage will ask: "Well, have you found that imp gall for me yet? I've got some research I need to get to." When you hand her the ingredient, she will be overwhelmed and hand you an unexpected reward, a leveled shield ring: "Ah... you've got it. Looks fresh, too! I realize that you'll be paid by your superior, but take this as well. It might come in handy in your work." When you exit the conversation, you will get one last piece of advice: "Next time, on time, please." The Shield Ring she's holding is unenchanted. When she gives it to you as a reward after the quest, it is a leveled ring with a constant Shield effect. The Shield Ring stays in Aryarie's inventory after she supposedly hands it over, as the script that is supposed to remove the reward ring is incorrect. Aryarie was supposed to choose between wandering on the second floor or near the alchemical between 11am and 3pm. However, the conditions attached to the percentage values, which would have been 33% and 66% respectively, can never be attained. Therefore, Aryarie will only take into consideration the second floor package as it is the highest up in the load order. Furthermore, as the radius is set to 0, she will simply stand still.